Don't want to spend a ton of money on a new vehicle? Don't trust a used vehicle? Then consider a Certified Pre-Owned vehicle. Certified Pre-Owned vehicles offer the confidence of a new car while also offering drivers in Dublin, Columbus, Delaware, Springfield and Easton Town Center a more affordable price. 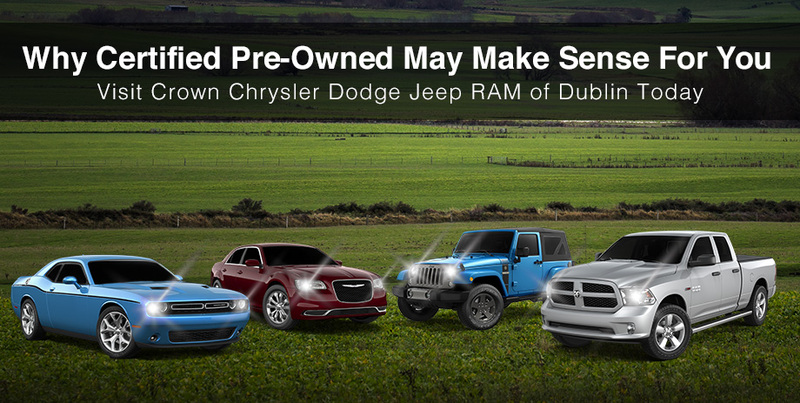 When choosing a Certified Pre-Owned Chrysler, Dodge, Jeep or RAM from Crown CDJR of Dublin, you can count on it running like it's brand new. That's because in order for these vehicles to be declared Certified Pre-Owned, they must undergo an extensive certification process, ensuring only the finest earn the label. While few CPO programs are exactly alike, the CPO program offered by Chrysler Dodge Jeep RAM of Dublin includes Lifetime Certified Warranty Upgrades so that your CPO vehicle will be protected for as long as you own it. Discover our available selection of CPO vehicles when you visit us at Crown ChryslerDodge Jeep RAM of Dublin. Fill out the form to schedule a test drive, or visit our dealership today.